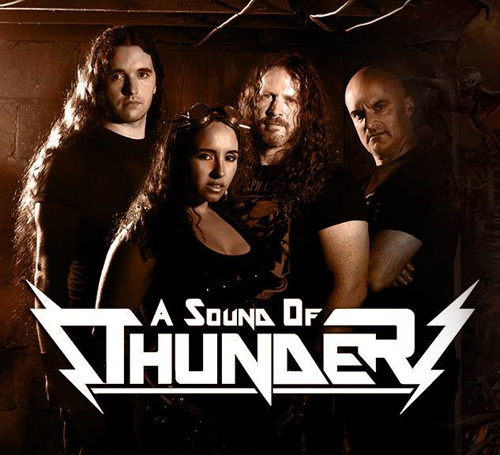 On the strength of another successful Kickstarter crowd funding campaign, A Sound Of Thunder (ASOT) returns with their seventh studio album, It Was Metal. The album features guest appearances from Accept's Mark Tornillo on Phantom Flight and legendary keyboard player Tony Carey (Rainbow, et al) on Obsidian & Gold. Also, the album has a companion graphic novel (sold separately), with original stories based on the songs written and drawn by talent from Marvel Comics, DC Comics, and Valiant Entertainment. I'm a long time fan ASOT, so it's kind of hard to be objective in a review. That's not to say I'm some slobbering and gushing fan-boy; there have been some tunes on some albums that I've liked better than others. With It Was Metal, it seems that ASOT is going back to their roots when Josh Schwartz and crew intended to resurrect and create classic heavy metal for a modern generation. The tunes within are fast and heavy, catchy, and full of gusto and groove. Of course, as I've said in the past, any ASOT song turns simply upon their crafty and creative song arrangements, and Schwartz's compelling and deadly guitar wizardry. Even more, in the song compositions the bass and drums are easily heard. Often a Schwartz guitar solo will ride over a robust bass line, as within It Was Metal, which is very cool. As for the songs, I'll touch on some of my favorites. Phantom Flight, featuring Mark Tornillo, is an easy favorite; it combines speed and groove for some powerful classic heavy metal. Another great song is Obsidian & Gold, which features Tony Carey. It's a typical diverse ASOT arrangement with lighter vocal parts, intense movements of riffage, and the swirl of Carey's synths and Hammond, notable in the middle and with later guitar solo. Something of a heavy metal anthem comes with the re-imagining of the Catalonian national anthem in Els Segadors (The Reapers). It rises and roars from a combination of brisk riffs, Nina Osegueda soaring vocals, and a quite catchy refrain. The song gets even more powerful when, after the midpoint, the pace accelerates with the guitar solo burning above. Charles II brings ASOT back to power metal rock with a quick pace, tight groove, and catchy melody. Yet, for my money, the best track here is It Was Metal. Sharp riffs introduce another steady, often hastening, heavy metal number where the bass line is heard, the groove is invigorating, and the chorus is simply catchy killer. When Osegueda belts out the chorus she reminds me of a female Rob Halford. Then there's also aforementioned guitar solo riding along the bass line after the halfway mark, which kills. Yeah, okay, so I'm a fan. A Sound Of Thunder has done it again. It Was Metal delivers classic and melodic heavy power metal with all the fire and fury ASOT can muster. Easily recommended. A Sound Of Thunder has done it again. 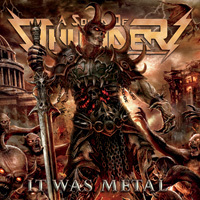 It Was Metal delivers classic and melodic heavy power metal with all the fire and fury ASOT can muster. Easily recommended.